Eric's pondering and musings from Brooklyn, Boston, and wherever life takes me. : Drug Dealer, Stripper, Beggar, Street Performer, or Waitor? Drug Dealer, Stripper, Beggar, Street Performer, or Waitor? Last night, I went to hear the National Geographic Live presentation on Gorongosa National Park. It was an awesome presentation about conservation. I took my future brother-in-law with me. We grabbed a slice of pizza at a local shop just around the corner from NYU where the lecture was happening. As we were eating, I saw this man (pictured above) stroll in and start pulling crumpled bills from every pocket. He had them in all six of his jacket pockets and all four of his pants pockets. They were $20s, $10s, $5s, and $1s. He piled them all on the table to count them. He then pulled out some reading glasses and a tiny bible that had a lot of writing on the inside cover. 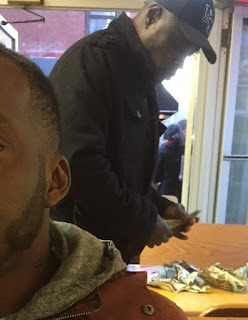 He called someone and said that he was ready and had the money and needed to meet in an hour to get the stuff. He asked them to call him when he was in the area. I just thought it was interesting. When he left, my soon to be brother-in-law and I were trying to figure out how he got the money. I was guessing he was a beggar except for the $20 bills. It made me wonder. He doesn't look like stripper. He could be an amazing street performer? Do drug dealers make calls like that? Maybe he was calling his supplier? Do people give beggars $20 bills? If he was a waiter, he didn't talk, dress, or act like one....or a bartender.